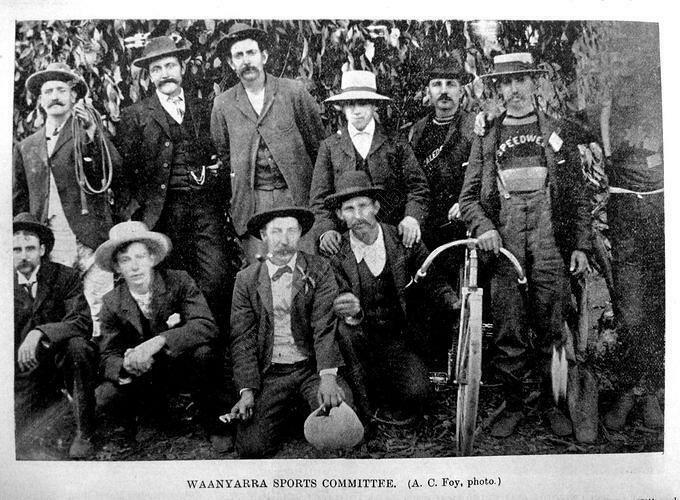 which may be of interest to visitors to the Waanyarra site. I apologise for the long break since the last Newsletter, but I will try and rectify that in the next couple of months. Unfortunately this email is only going to those who have a current email address registered with me, so if you know of anyone who is interested in Waanyarra who is not on email please pass on a copy and also encourage anyone with an email address to pass it on to me so I can add them to my mailing list. 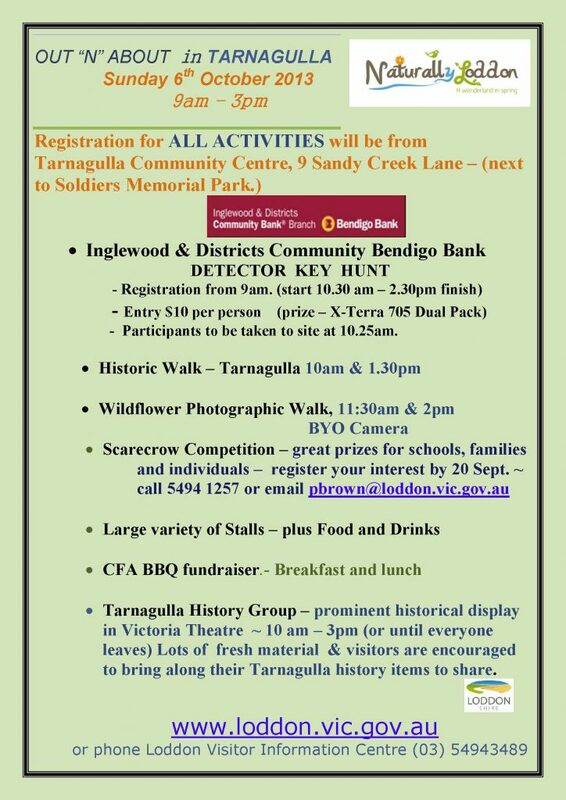 Meanwhile the Tarnagulla History Group will be holding its 4th Annual History Weekend at Tarnagulla on Saturday 3rd and Sunday 4th October 2015. 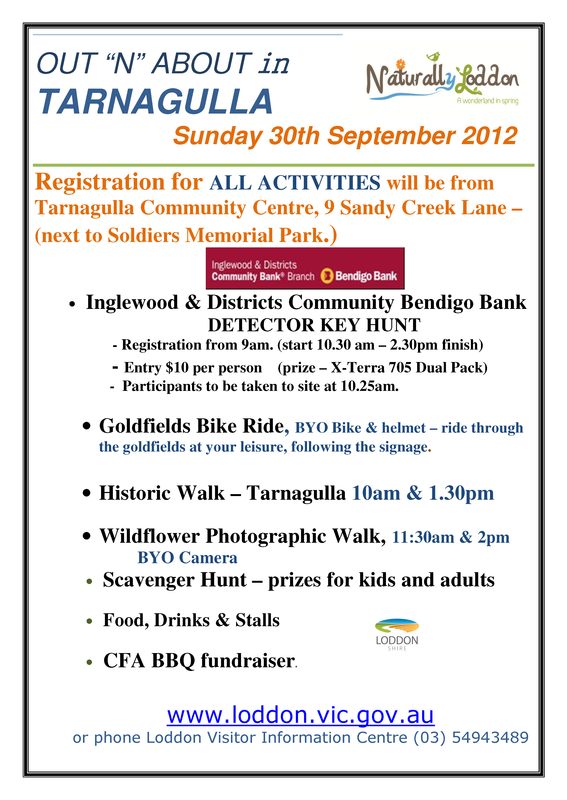 This event is of course part of the Out And About In Tarnagulla weekend which is conducted each year under the auspices of the Shire of Loddon. You can see from the brochure attached that many activities are scheduled, especially on Sunday 4th, and all visitors can be assured of an enjoyable, interesting and fun time. 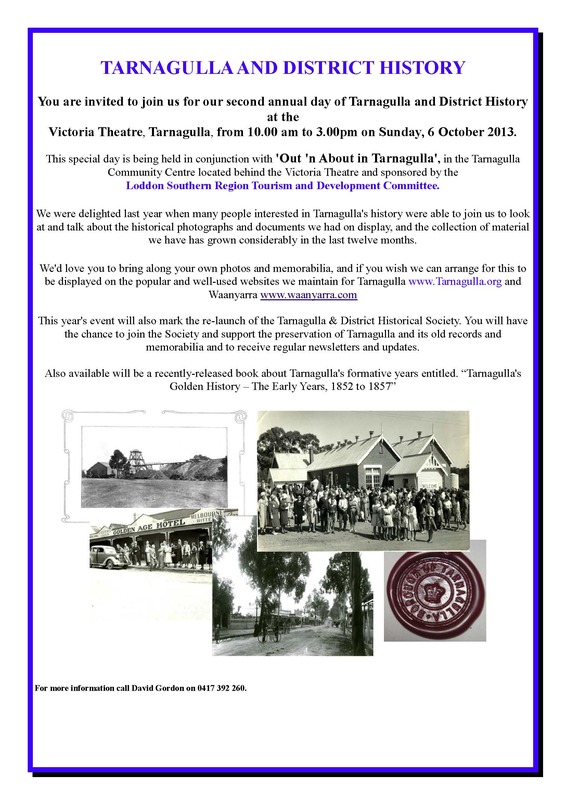 The historic Victoria Theatre is once again the venue for the history exhibition, and the display has become a very popular focal point for both family historians and those with an interest in Tarnagulla’s past. 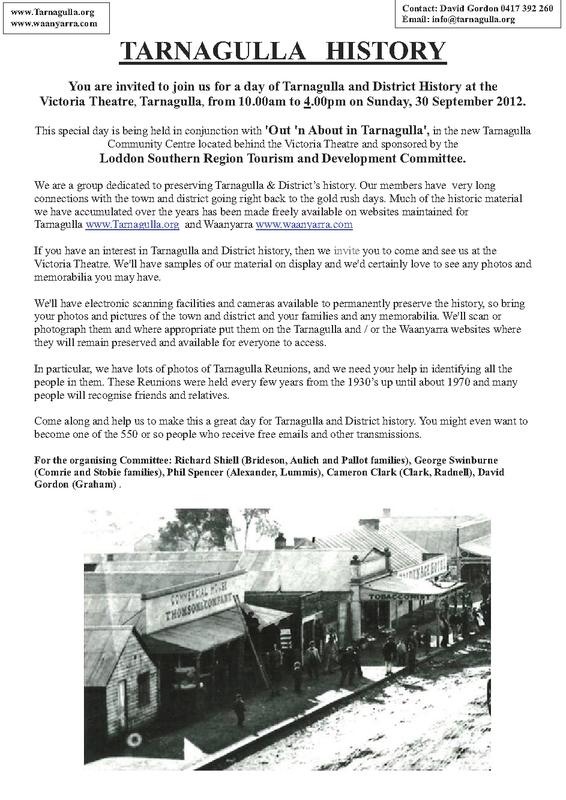 As you know the Tarnagulla History Group (driven with a vengeance by David Gordon) is always on the lookout for anything associated with Tarnagulla and District history. If you have something you can share, then please bring it along. Barbara Thompson recently allowed David to scan and upload another large segment of her excellent collection of Davies family images, and these can be seen at: http://www.tarnagulla.org/photogallery/gallery3/index.php/tag_albums/album/13/William-Morgan-Davies-Family-Collection . 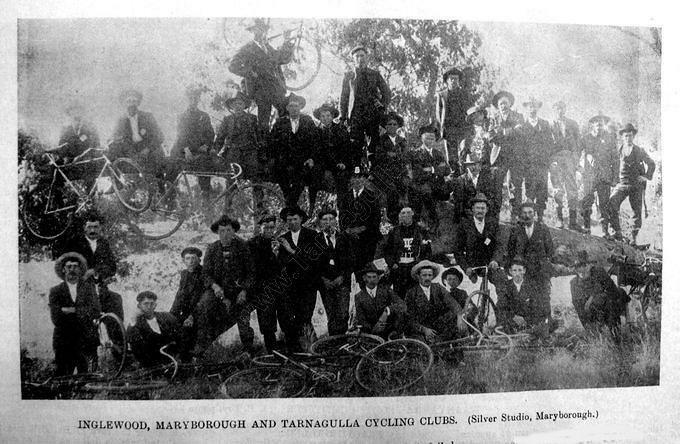 The Davies were a huge part of Tarnagulla. John Davies was one of four Welshmen who each had a quarter interest in this fabulously wealthy Prince of Wales claim on the Poverty Reef mining claim. In 1876 William and Emma Davies took over the proprietorship of the Victoria Hotel and Theatre. They proved to be excellent hoteliers, and would successfully operate the hotel for the next 28 years. WM Davies passed away in 1898 and Emma eventually disposed of the business in 1904. Barbara Thomson has indicated she will have her photographic collection at the Tarnagulla History Group Display at the ‘Out and About’ weekend in October, and you will be able to see all the original old images which are in excellent condition considering their age. Of special interest will be a programme of events for a fund-raising concert held at Newbridge Mechanics’ Institute in 1893. This beautiful program has been printed on silk cloth by Thomas Page of the Tarnagulla Courier, and is of real historical importance. Barbara also has a photograph of several of the actors in the concert, two of whom would become her great grandparents – Emma Davies and Thomas Leonard! Also available will be part 3 of David Gordon’s latest Book Tarnagulla’s Golden History, subtitled “Progress, Development and the Big Miners – 1869 to 1890“. The cost is $27 postage included, and you can email David direct at davidstephen48@gmail.com if you would like to make arrangements to buy a copy. This is the best of David’s books, all of which are a must for old Tarnagulla’ites or those interested in its history and is great reading. Highly recommended. If you have not recently visited the Tarnagulla website at www.tarnagulla.org then you should do so as there is a wealth of new material that has been uncovered. A great deal as a result of the good and tireless work of David Gordon. Below are a couple of Waanyarra photographs recently added to the Tarnagulla site by David Gordon. Here’s a longer report on the day’s activities. It’s risky to name names because I’m certain to forget someone, but I must thank those that helped with the set-up and bump-out including Phil Spencer (who did a magnificent job with the rolling video display, signage, scanning, etc. ), Rod Corrie (who came up from Geelong for the two days), Richard and Trish Shiell for their lovely collection of Aulich/Pallot/Brideson material, George Swinburne (always a solid contributor and also convenor of the Waanyarra reunions) and Cameron Clark who wasn’t able to be there on the day but provided a great deal of support via the website and so on. Peter Williams brought along the family’s entire collection of old photos and there is some great material there which we will need to arrange with Peter to copy and put up on the website. There are some particularly nice old large-format photos of Thomson and Comrie’s Exchange Store, and these certainly need to be preserved. The Charles Baker (ex-postmaster, among other things) family had some nice pictures and documents as did Coral and Des Akers, Wilma and Dave Evans, Edna Arnold, Keren and Dennis Carnell, and the list goes on and on. If I’ve forgotten you, I apologise. It was a very, very busy day. 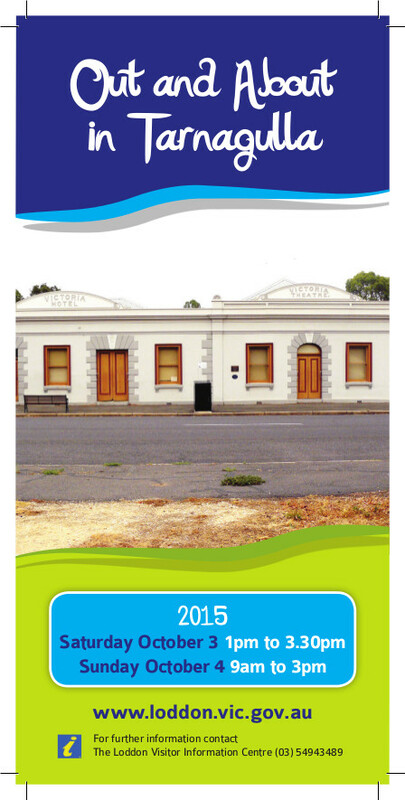 I must pass on a vote of thanks to the Victoria Hall Committee, all the Out ‘n About team including Jan King, Jan Sharman and the others, Wendy Sutton and the CFA team for the nicely-cooked sausages and also Robyn Vella of the Shire of Loddon who was so helpful to us. I must also mention Councillor Allen Brownbill and his partner who very kindly helped with the theatre pack-up. Allen is of course very supportive in many ways. I have several photos of the day’s activities which I’ll post up over coming days.